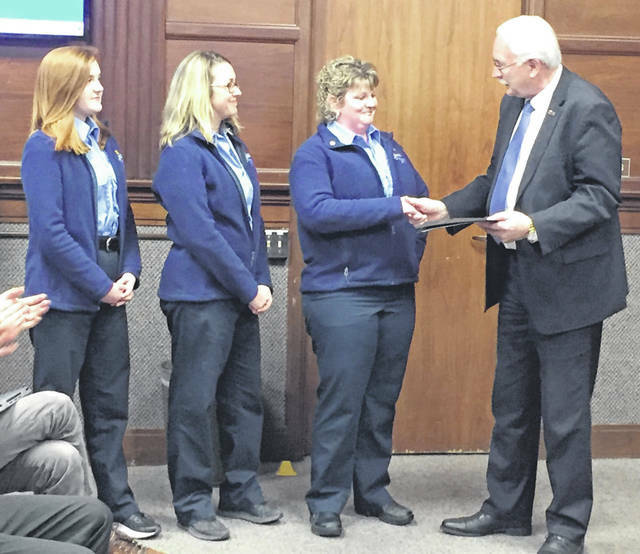 Sidney Police Department’s dispatchers, Abbey Goings, from left to right, Cindy Smith and Renee McDowell accepted the National Public Safety Telecommunications Technician Week proclamation presented by Mayor Mike Barhorst during the Sidney City Council meeting Monday, April 8, 2019. Ryan Heitman, Sidney Fire Department’s newest lieutenant, left, was introduced by Fire Chief Brad Jones during the Sidney City Council meeting Monday, April 8, 2019. SIDNEY — There was a packed house Monday night during the Sidney City Council meeting when Sidney Fire Department’s newest lieutenant, Ryan Heitman, was introduced and Sidney’s dispatchers were honored. Sidney Fire Chief Brad Jones introduced Heitman to council and the roughly 70 some people in attendance. 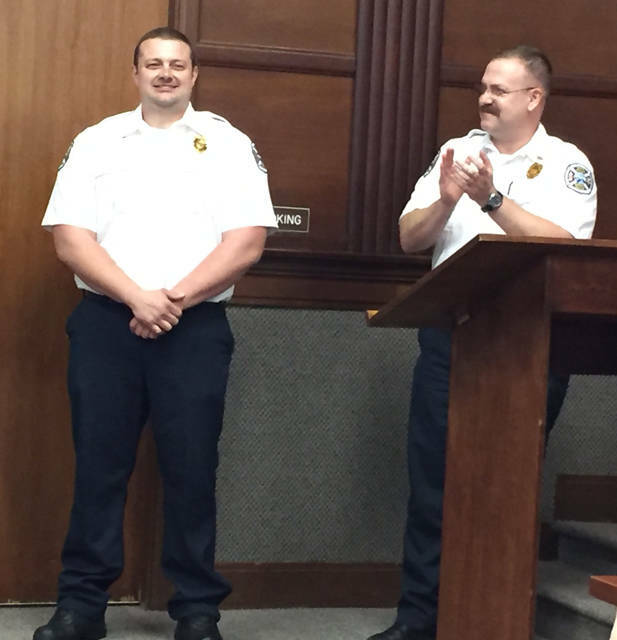 Jones told the crowd Heitman’s promotion was effective Monday, April 8, 2019, as he was officially sworn-in as Sidney newest fire lieutenant that afternoon at Fire Station No. 1 by Mayor Mike Barhorst. Heitman started with the Sidney Department of Fire & Emergency Services on Sept. 25, 2006. Jones said he is a firefighter/paramedic as well as a fire instructor, fire investigator, fire inspector, HazMat tech, and is a current member of the health and safety committee. Heitman was also named Sidney Firefighter of the Year in 2012. He and his wife Holly live in Houston with their three boys, Blake, Landon and Austin. Heitman joked he was excited thinking the crowd (in attendance for a variety of items on Monday’s agenda) showed up to witness his introduction to City Council. The crowd laughed. He then thanked council, Jones and his fire crew before saying, in a lighthearted manner, he would “try not to screw it up.” In response, the room erupted in applause. The next item before council was Barhorst’s presentation of the National Public Safety Telecommunications Technician Week proclamation to dispatchers. Barhorst said public safety telecommunicators are the single vital link for our law enforcement and fire personnel as they monitor their activities by radio, providing them information and ensuring their safety. He noted the safety of law enforcement officers, firefighters and emergency medical personnel is dependent upon the preciseness and accuracy of information obtained from citizens who telephone the city of Sidney telecommunication center. Telecommunicators contribute substantially to the apprehension of criminals, suppression of fires and treatment of those suffering injuries, he said. Dispatchers Abbey Goings, Cindy Smith and Renee McDowell accepted the honor on behalf of their division of Sidney Police. McDowell thanked council for the annual recognition from the city. During the public comments portion of the meeting, Bon Air Circle resident John Adams, who first approached City Council on Feb. 25 with questions about the proposed levy on the upcoming May ballot and for clarity about Fire Station No. 3, again brought forth several more questions Monday. “I for one believe that with a 40 percent cut to road repair with this new permanent tax on income, it will not be sufficient to keep Sidney’s roads in good condition. Why a special election? It is well known that special elections have a low voter turn out because voters are conditioned to vote in primaries and general elections. The rub with voters that I have spoke with, is the fact that City Council is combining these two separate issues. A third fire house is not warranted at this time,” Adams said. • Where does the standard (fire and EMS) response time come from? Is this a federal guideline? • Do all cities (such as Piqua, Troy and Tipp City) use the same guidelines? • How do percentages change to response times for fire/EMS calls when seconds are added to your response of say 7, 7.5, 8, etc.? • Why does west Sidney have an economical/small fire station to serve all of west Sidney compared to station proposed? • The fire department currently covers all of Sidney. Why would there need to be seven new hires? It this another formula? • Were there any studies on a more more cost effective station similar Sidney’s west building and staff? • The population of Piqua and Sidney are virtually identical; yet Piqua has one fire station while Sidney is proposing a third. Can this be explained? • Can road repair revenue be used for anything other than roads with the current road levy? Can the current levy dollars be used for wages? “I guess the final question (offered verbally) is, no where on the ballot language is the word permanent. Why is that? It’s a permanent tax, rather than the one we voted on the last five years. I’m just curious why that verbiage is not on there. As voters, if it’s going to be a permanent tax, I think it’s incumbent upon the leaders of Sidney to let us know it’s going to be permanent. (It’s) no where in the language,” Adams said in closing. Barhorst briefly responded saying the ballot language must be approved by the secretary of state’s office, which he said he was certain Adams was aware of, and that is one of the reasons the wording is the way that it is. At the end of the council meeting, during staff comments, Jones pointed out the May election is not a special election. He said it will not cost the city of Sidney anything for the election of which the tax levy will be on the ballot. In other business, council also received an update on the Ohio Building roof repairs from City Manager Mark Cundiff. He told council that during the roof’s removal they realized there were seven roof layers on the Ohio Building. He displayed several pictures of the dilapidated roof, prior to its removal, and what was under the decay. Cundiff said city staff didn’t know the extent of the damage until the old roof was removed. Workers have removed the entire roof and are re-enforcing damaged wooden beams before laying a new roof. As of April 2, 2019, Cundiff said the city has spent $91,138.15, which includes asbestos removal, since the 2016. The city acquired the title to the property in July 2017 through foreclosure. He said the total cost to get the building ready for a developer, between the roof work, HVAC system refrigerant replacement, and to repair the front door, is estimated be $572,718. Council member Steve Wagner asked for a reminder of what the cost would have been to demolish the building. Cundiff said they think it would have cost about $750,000 to take the building down. Cundiff said city staff thinks they are still ahead financially. He also said a lot could go wrong if the building was taken down wrong. Community Development Director Barbara Dulworth said, when asked, she assumes the roof will be completed by the end of April.